True confession - sometimes I don't even serve myself turkey on Thanksgiving. Yes, I know it is the centerpiece of the meal, but to me it seems to take up space that could be occupied by the sides. And oh, Thanksgiving has great sides. I have my favorites (stuffing, ooooh, stuffing how I love you) but I always like to try a new dish or two because you never know what could be a new classic. 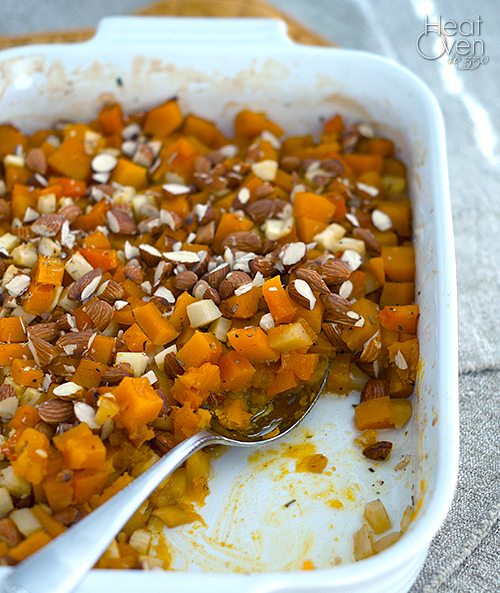 And this roasted squash dish is definitely a new classic. Let's talk about roasting for a second, and the magical things it does for squash. Roasting is hands-free and gives squash a sweet flavor with a caramel-like hint. Win-win on both those accounts. In this dish there are three types of veggies roasted together - two types of squashes for slight differences in flavor/texture/sweetness, and parsnips for a little kick. For those of you who haven't tried parsnips yet, go do it. The best way I can describe them is like carrots with attitude. They have a sweet/peppery flavor that adds so much to this dish. (Just be sure to cut out most of the woody cores that some of the very large parsnips have.) The squash and parsnips are tossed in a butter/maple sauce giving them extra sweetness and rosemary is added to the mix to add more flavor. The almonds on top add more flavor and some great texture. I definitely wouldn't skip adding them. In all this small list of ingredients adds up to a seriously delicious side dish. Most of the time to prepare this dish is spent up front doing some serious chopping so it is a good dish to make ahead of time. 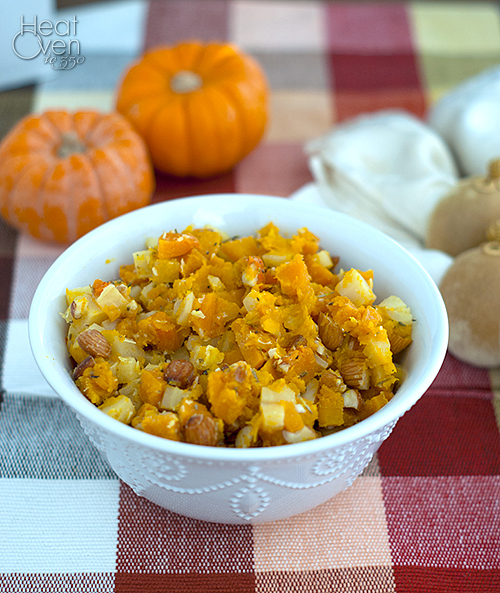 If you are looking for a new squash dish for your Thanksgiving meal this year, this one is bound to be a hit. Heat oven to 375 degrees. Cover the baking dish with foil and bake 40 minutes. Uncover and bake until the squash is tender, another 10-20 minutes longer. (if you cut your pieces larger than 1/2 inch cubes you might want to cook the dish even longer.) Sprinkle with almonds and bake another 10 minutes. Serve. I love what you did with your squash, Nicole! I roast squash a lot, but I've always used olive oil. I'll bet the butter gives it so much flavor. Parsnips are one of my favorite root vegetables. Pinning this! I totally understand, I only take a small piece of turkey out of obligation (to the holiday), haha. This squash sounds awesome! I can taste the butter...mmmmm.